Once winds within tropical system reach 39 mph and the distinct low pressure area is well defined by a rotating circulation, the system is considered a tropical storm and is given a name. A Tropical Storm that has sustained winds exceeding 74 mph or greater, dangerously high water and rough seas. Check into flood insurance. You can find out about the National Flood Insurance Program through your insurance agent or the Emergency Management Department. There is normally a 30-day waiting period before a new policy becomes effective. Homeowners polices do not cover damage from the flooding that accompanies a hurricane. Prepare window protection methods. Permanent shutters are the best protection. A lower-cost approach is to put up plywood panels. Use 1/2 inch plywood (marine plywood is best) cut to fit each window. Remember to mark which board fits which window. Pre-drill holes every 18 inches for screws. Do this long before the storm. You are responsible for your safety, and now is the time to get prepared. The Charleston County Hurricane Guide is filled with information about developing a family communications plan, creating an emergency supplies kit, protecting your home from damage, evacuation information and much more. The guide is available in two formats: a standard page size for easy printing at home and a booklet for churches, groups and associations to hand out to their members. Share the guide with your family, friends and neighbors. Print the booklet one-sided on legal size paper. The printer will print the first and last pages on one sheet of paper; the second and next-to-last pages on another sheet of paper; and so on. They will appear out of order. Photocopy the pages back to back (double-sided) and then fold, staple or bind them together in the center. Once folded in the center, the pages will be in the correct order. Do you know the projected flood elevation for your area? Ask the Emergency Management Department or Building Services Department to see a flood map of your community. There may be a projected flood elevation for your neighborhood. This information will help you determine how much water is likely to come in. Is the main electric panel board located above potential flood waters? The main electric panel board (electric fuses or circuit breakers) should be at least 12" above the projected flood elevation for your home. The panel board height is regulated by code. All electrical work should be done by a licensed electrician. Consider elevating all electric outlets, switches, light sockets, baseboard heaters and wiring at least 12" above the projected flood elevation for your home. You may also want to elevate electric service lines (at the point they enter your home) at least 12" above the projected flood elevation. In areas that could get wet, connect all receptacles to a ground fault interrupter (GFI) circuit to avoid the risk of shock or electrocution. Have electrical wiring done by a licensed electrician. Are the washer and dryer above potential flood waters? For protection against shallow flood waters, the washer and dryer can sometimes be elevated on masonry or pressure-treated lumber at least 12" above the projected flood elevation. Other options are moving the washer and dryer to a higher floor, or building a floodwall around the appliances. Furnaces that operate horizontally can be suspended from ceiling joists if the joists are strong enough to hold the weight. Installing a draft-down furnace in the attic may be an option if allowed by local codes. Some heating vents can be located above the projected flood elevation. Outside air conditioning compressors, heat pumps or package units (single units that include a furnace and air conditioner) can be placed on a base of masonry, concrete or pressure-treated lumber. All work must conform to state and local building codes. Is the fuel tank anchored securely? A fuel tank can tip over or float in a flood, causing fuel to spill or catch fire. Cleaning up a house that has been inundated with flood waters containing fuel oil can be extremely difficult and costly. Fuel tanks should be securely anchored to the floor. Make sure vents and fill-line openings are above projected flood levels. Propane tanks are the property of the propane company. You'll need written permission to anchor them. Be sure all work conforms to state and local building codes. Does the floor drain have a float plug? Install a floating floor drain plug at the current drain location. If the floor drain pipe backs up, the float will rise and plug the drain. Does the sewer system have a backflow valve? If flood waters enter the sewer system, sewage can back up and enter your home. To prevent this, have a qualified, licensed plumber install an interior or exterior backflow valve. Check with the Building Services Department for permit requirements. Flood Zones: Do You Live In One? How do I know in which flood zone a property is located? Your local government can tell you in which flood zone your property is located. For unincorporated Charleston County, Awendaw, Kiawah Island, Meggett, and Rockville, contact the Charleston County Planning Department to obtain a flood zone determination. Flood zone determinations are available for property in other municipalities in Charleston County through the applicable municipality. Flood Insurance Rate Maps for Charleston County are also available on-line at the Federal Emergency Management Agency (FEMA) map service center. Is Charleston County potentially subject to hurricane storm surge flooding? Charleston County has experienced many hurricanes and other severe storms throughout our history, the most recent of which were Hurricanes Hugo in 1989 and Hurricane Floyd in 1999. The greatest threat for flooding in the Charleston County area is from storm surge associated with a hurricane from the Atlantic Ocean. What do the flood zone designations on the Flood Insurance Rate Maps mean? Zone A: No base flood elevations determined. Zone AE: Base flood elevations determined. Zone AH: Flood depths of 1 to 3 feet (usually areas of ponding); base flood elevations determined. Zone AO: Flood depths of 1 to 3 feet (usually sheet flow on sloping terrain); average depths determined. For areas of alluvial fan flooding, velocities also determined. Zone A99: To be protected from 100-year flood by Federal flood protection system under construction; no base flood elevations determined. Zone V: Coastal flood with velocity hazard (wave action); no base flood elevations determined. Zone VE: Coastal flood with velocity hazard (wave action); base flood elevations determined. Shaded Zone X: Areas of 500-year flood; areas of 100-year flood with average depths of less than 1 foot or with drainage areas less than 1 square mile; and areas protected by levees from 100-year flood. Zone X: Areas determined to be outside 500-year flood plain. Zone D: Areas in which flood hazards are undetermined, but possible. Additional information regarding flood zones and flood insurance is available from the National Flood Insurance Program. Can all properties in Charleston County get flood insurance? Federally subsidized flood insurance is available through the National Flood Insurance Program for most properties located in Charleston County and its inclusive municipalities. Damage caused by flooding is not covered by a standard homeowner's insurance policy. A separate flood insurance policy is required for flood peril coverage. Flood insurance is available for buildings only, contents only, or both buildings and contents. Insurance agents or the National Flood Insurance Program should be contacted for flood policy information. There is generally a 30-day waiting period for flood insurance policies to become effective. Charleston County currently has a few parcels of land that could potentially be developed located in "Coastal Barrier Resource Act" protected areas (COBRA zones). Under Federal law, the National Flood Insurance Program may not issue flood insurance policies for structures built in COBRA zones. If flood insurance is available for structures built in COBRA zones, it will be through a private insurer. What regulations apply to construction-related activities in Flood Zones? The Charleston County Flood Damage and Prevention Ordinance mandates that certain procedures be followed for construction-related work within properties designated as flood zones on the Charleston County Flood Insurance Rate Maps. Copies of this ordinance are also available from the Charleston County Building Services Department upon request. Is there a limit to how much work can be done to an existing structure in an Flood Zone? The National Flood Insurance Program requires that if the cost of reconstructing, rehabilitating, adding to, or otherwise improving a structure equals or exceeds 50 percent of the building's assessed or appraised value, then the building must meet the same construction requirements as a new building. An improvement of 50 percent or more to a structure is known as a "Substantial Improvement". These requirements also apply to buildings that are substantially damaged; however, the value used in making the substantial improvement determination is the pre-damage value of the structure. In Charleston County and the jurisdictions for which it provides inspection-related services, the values of construction work on building permits taken out on a property during the past five (5) years are included in the determination of a "Substantial Improvement." This regulation is enforced through the construction permitting process. Any questions regarding "Substantial Improvements" may be referred to the Building Services Department<?a>. What are the special requirements for construction in "A, AE, AH, AO, A99" Flood Zones in Unincorporated Charleston County? The finished floor of all new and substantially improved residential structures must be elevated to a minimum of one foot above the base flood elevation indicated on the applicable flood insurance rate map. A flood elevation certificate indicating this elevation must be submitted prior to any building inspection except for a foundation inspection. This certificate must be of the latest version available. Only non-residential structures in all "A" flood zones may be floodproofed to a minimum of one foot above the base flood elevation in lieu of elevating the finished floor to this elevation. A pre-construction (prior to the plans being released for permit) and an as-built (prior to final building inspection) floodproofing certificate must be completed by a South Carolina registered Architect and/or Professional Engineer for all floodproofed buildings. Construction plans for floodproofed buildings must also be sealed by a South Carolina registered Architect and/or Professional Engineer. With the exception of one electrical outlet and one switch on a Ground Fault Interrupter (as required to meet the National Electrical Code), there may be no electrical wiring, plumbing fixtures, mechanical fixtures, other equipment, appliances, or ductwork located within new or substantially improved structures below one foot above the base flood elevation. Replacement HVAC systems in all "A, AE, AH, AO, A99" flood zones must be located either at or above the existing finished floor elevation or the base flood elevation, whichever is lower, unless the property is undergoing a "Substantial Improvement," in which case the HVAC system must be elevated to or above one foot above the base flood elevation. Per FEMA, only Flood Resistant Materials Technical Bulletin 2 (Class 4 or 5 materials) are permitted to be used below the base flood elevation unless the structure is a floodproofed non-residential structure. Enclosed areas below the base flood elevation (e.g. garages, sheds, crawl spaces, etc.) must be provided with flood control vents located and sized in accordance with FEMA requirements (e.g. a minimum of two (2) openings on different walls, located within a maximum of 12 inches of grade, sized at a minimum of one square inch per one square foot of enclosed area, with vents that allow the free-flow of flood waters at all times. If these specifications are not met, a South Carolina registered Architect or Professional Engineer must certify in writing that the structure is designed to comply with FEMA requirements regarding equilization of hydrostatic and hydrodynamic forces. Permitted uses below the base flood elevation are restricted to those necessary for building access, vehicle parking, and limited storage of yard-related equipment. Refer to the Charleston County Flood Damage and Prevention Ordinance. What are the special requirements for construction in "V and VE" Flood Zones in Unincorporated Charleston County? The lowest horizontal structural member of all new and substantially improved structures must be elevated to a minimum of one foot above the base flood elevation indicated on the applicable flood insurance rate map. A flood elevation certificate indicating this elevation must be submitted prior to any building inspection, except for a foundation inspection. This certificate must be of the latest version available. Wall section and foundation plans for structures in "V or VE" flood zones must be designed and sealed by a South Carolina Registered Professional Engineer and/or Architect. Plans must detail breakaway wall construction, foundation design, and scour depth. If spread footings are used, the bottom of the footing must be a minimum of 12 inches below the anticipated scour depth at the structure location. Pre-construction "V-Zone design" and "V-Zone Breakaway wall" certificates must be submitted with the construction plans for review. As-built "V-Zone design" and "V-Zone Breakaway wall" certificates must be submitted prior to a final building inspection. Obtain copies of these certificates from the Charleston County Building Services Department. With the exception of one electrical outlet and one switch on a Ground Fault Interrupter (as required to meet the National Electrical Code), there may be no electrical wiring, plumbing fixtures, mechanical fixtures, other equipment, appliances, or ductwork located within new or substantially improved structures below the design flood elevation (base flood elevation plus freeboard). Replacement HVAC systems in all special flood hazard areas (flood zones) must be located either at or above the existing finished floor elevation or the design flood elevation, whichever is lower, unless the property is undergoing a "Substantial Improvement," in which case the HVAC system must be elevated to or above the design flood elevation. Per FEMA, only Flood Resistant Materials Technical Bulletin 2 (Class 4 or 5 materials) are permitted to be used below the base flood elevation. Permitted uses below the design flood elevation are restricted to those necessary for building access, vehicle parking, and limited storage of yard-related equipment. All walls below the design flood elevation in a V or VE flood zone must be designed and certified by a South Carolina registered Professional Engineer and/or Architect to break away from a water load less than that which would occur during the base flood. No fill is permitted to be used for structural purposes in "V and VE" flood zones. Landscaping fill is only permitted if a South Carolina registered Professional Engineer certifies in writing that the fill will not cause wave run-up or deflection. No obstructions are permitted below the base flood elevation within a structure. Obstructions not located within a structure (e.g. permanent planters, elevated swimming pools, elevated tennis courts, certain types of fences, etc.) are also not permitted unless a South Carolina registered Professional Engineer certifies in writing that the obstructions will not cause wave run-up or deflection. Where can I get a "flood elevation certificate" to determine the actual elevation of my structure? For properties located in Unincorporated Charleston County, Awendaw, Hollywood, Kiawah Island, Meggett, Ravenel, Rockville, and Seabrook Island, the Charleston County Building Services Department maintains copies of flood elevation certificates for all new construction and substantially improved structures. If your structure was constructed in one of these jurisdictions since 1990, the Charleston County Building Services Department may have an elevation certificate on file for your structure. For structures where an elevation certificate is not available on file, a S.C. Registered Land Surveyor will need to survey the elevation of the structure and complete the flood elevation certificate form. Charleston County does not survey structures for the purpose of completing flood elevation certificates. Where can I get information on safety measures for flooding? The Charleston County Emergency Management Department has information available on safety measures for flooding and other hazard events. The Federal Emergency Management Agency also maintains an electronic library of resources on flood safety. The South Carolina Flood Mitigation Program office also provides information on flood safety. It is important to remember to not drive through flooded areas. How can I protect my property from flood-related damages? The Federal Emergency Management Agency maintains an electronic library of reference materials on topics such as retrofitting structures for enhanced flood and hurricane resistance and protecting building utilities from flood damages. The Charleston County libraries also have multiple publications available in their reference sections on protecting property from flood damages. Since Charleston County is subject to hurricanes, measures such as protecting glazed openings in your buliding against high wind damages should also be taken for property protection. If someone is dumping trash into the drainage ditches or system in my neighborhood, what should I do? Charleston County has passed an ordinance prohibiting the dumping of trash, landscape debris or other materials into stream channels, ponds, basins or ditches that regularly carry or store stormwater in the unincorporated areas of Charleston County. These channels are routinely cleaned and maintained by the Charleston County Public Works Department. Residents of Unincorporated Charleston County are encouraged to assist in maintaining the drainage channels and ditches by removing or reporting obstructions (i.e. shopping carts, debris, trash, etc.) at (843)202-7600. Keeping drainage channels free of obstruction reduces flooding potential in the event of heavy rains. If my property has been flooded, what should I do? Licensing and permit information is available from the Building Services Department. Does Charleston County have a plan to address preparing for floods and other hazard events? Charleston County coordinates a regional planning initiative, involving the County and municipalities within Charleston County, in developing and maintaining the Charleston Regional Hazard Mitigation Plan. This plan is updated annually to reflect changes that have occurred during the year. Anyone who would like to provide input into the Charleston Regional Hazard Mitigation Plan may do so by e-mailing the Building Services Department at buildingservices@charlestoncounty.org, or by calling the department at (843)202-6930. The public is also invited to attend committee meetings regarding plan updates. If you have any questions contact (843)202-6930. What if my property contains wetland areas or dunes? Flood hazard areas in Charleston County may contain wetland areas which serve natural and beneficial functions such as flood moderation, water quality enhancement, ground water recharge, and habitat for wildlife. Beachfront areas may also contain primary ocean front dunes, which serve as buffers against minor wave height fluctuations and beach erosion. Protecting these areas maintains their important functions. Activities that disturb beachfront and saltwater wetlands should not be undertaken without first obtaining permits from the South Carolina Department of Health and Environmental Control Office of Ocean and Coastal Resource Management. Any disturbance of freshwater wetlands requires a permit from the U.S. Army Corps of Engineers and certification from S.C. DHEC's Office of Ocean and Coastal Resource Management. Where can I get real time information on water elevations for streams and rivers in Charleston County? For topographic map information please contact the Building Inspections Department. These stream gage elevations are to be used for approximations only. Always follow emergency instructions that will be broadcast over local television and radio stations through the Emergency Alert System as weather advisories are released or updated by the National Weather Service. If evacuations are required, it is imperative that you follow instructions. Street patrols and door-to-door notifications may be used if an evacuation is mandatory. Generally, residents are given 48-72 hours notice in advance of a hurricane. Charleston County also uses a telephone notification system for emergency information. For more information and free registration, please visit http://alert.charlestoncounty.org. Questions regarding emergency procedures may be directed to the Charleston County Emergency Management Department. When a dangerous storm hits, you know what to do, but what about afterwards? Cooperation and proper clean-up procedures can go a long way toward regaining our way of life. Do your part to help speed up the recovery process! "Move from the water, Brace for the wind"
Follow the instructions and advice of your local government. If you are advised to evacuate, do so promptly. If certain travel routes are specified or recommended, use those routes (Charleston County Evacuation Directions and Map). Once an order is given you may not be allowed to select your route. If you plan to leave, leave early. If you are driving your car to another location, keep in mind it is best to leave early enough to avoid being marooned by flooding roads, fallen trees and wires. Make sure the gas tank in your car is full and listen to the radio as you travel for additional information and instructions from the government. Evaluate and be prepared to use parallel routes out of the community - this may include smaller roads that run parallel to the interstates and other highways. In advance of leaving your residence, prepare your family Disaster Kit and take it with you in the car. When an emergency is declared and an evacuation order is announced, designated shelters are opened by school officials, operated by the Red Cross and announced on local radio and television stations. While shelters are available in a hurricane situation, officials urge citizens to use alternative housing options, such as traveling to a friend's or relative's inland home or a motel. And remember, even inland shelters and motels may experience loss of electrical power. Take your Emergency Supplies Kit with you. Citizens who do relocate to a shelter are asked to bring blankets and pillows, some food for the first day and any necessary medications and sanitary supplies. It is highly recommended citizens bring their Emergency Supplies Kit. Zone A: West of the Ashley River - Unincorporated areas of Charleston County from the Ashley River to the Colleton County line; Atlantic Ocean to the Dorchester County Line. This includes the Town of Hollywood, Town of Meggett, Town of Ravenel, Town of Folly Beach, Town of Rockville, Town of Kiawah Island, the Town of Seabrook Island, James Island, Johns Island, Wadmalaw, and unincorporated Charleston County. Zone B: Central Charleston - From the tip of the Peninsula to Ladson Road; from the Ashley River to the Wando River. 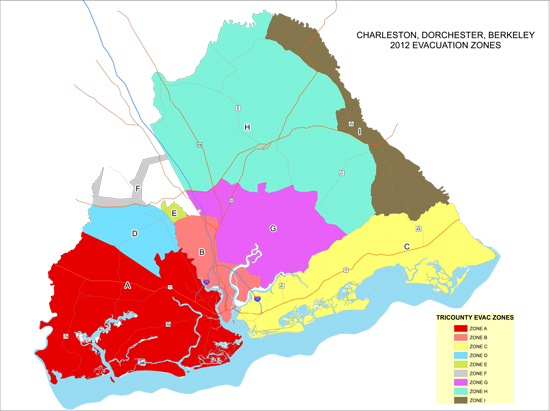 This includes City of Charleston, City of North Charleston, the Town of Lincolnville, Daniel Island, Thomas Island, and unincorporated Charleston County. Zone C: East of the Wando River - Unincorporated areas of Charleston County from the Atlantic Ocean to the Berkeley County line; Wando River to the Georgetown County line. This includes the Town of Mt. Pleasant, Town of Isle of Palms, Town of Sullivan's Island, Town of Awendaw, the Town of McClellanville, Dewees Island, Capers Island, and Goat Island. Zone D: Sand Hills Area - West of Dorchester Road and the Ashley River, 17A to the Colleton County line and all areas bordering Charleston County. Zone E: Miles Jamison/Oakbrook Area - Miles Jamison Road, between Ladson Road, to Bacons Bridge Road: including the Lakes of Summerville, Newington Plantation, Crestwood Subdivision south to Orangeburg Road, and South Main Mobile Home Park. Zone F: The Swamp - Any other low-lying areas including the Cypress Swamp area, the Edisto River area and the Twin Lakes Subdivision. North of Woods Ave from end of road at east edge of rail yard to its intersection with Remount Rd. North of Remount Rd from its intersection with Woods Ave to its intersection with the railroad tracks just west of Dutton Ave.
East of the railroad tracks from their intersection with Remount Rd to crossing over the Goose Creek (just south of Middle Earth Nursery and Infinger Furniture). Including all homes and businesses northeast of the intersection of Hwy 52 and Camelot Dr, continuing along Ryan Dr and Holly Ave across to Westview Blvd (includes buildings on both sides of Camelot Dr, Ryan Dr and Holly Ave). Crowfield Plantation from Westview Blvd near Holly Ave across I-26 along Ancrum Rd to its intersection with Hwy 78. Northeast of Hwy 78 from its intersection with Ancrum Rd (Ladson Rd) to its intersection with Hwy 17A (Main St) in Summerville. Southeast of Hwy 17A (Main St/S Live Oak Dr) from its intersection with Hwy 78 to its intersection with Cypress Gardens Rd. South of Cypress Gardens Rd from its intersection with Hwy 17A (S Live Oak Dr) to its intersection with Pimlico Blvd. South of Pimlico Blvd from its intersection with Cypress Gardens Rd through to its end. The area east of Wappaoolah Plantation and west of the Cooper River, north of Pimlico Blvd and south of Mepkin Abbey. Southeast of the railroad tracks from the Cooper River by Pimlico to its intersection with Hwy 402. South of Hwy 402 from its intersection with the railroad tracks near Cordesville to its intersection with Hwy 41 (Hwy 402 becomes Steed Creek Rd). Southwest of Steed Creek Rd from its intersection with Hwy 41 to its intersection with Halfway Creek Rd. West of Halfway Creek Rd from its intersection with Steed Creek Rd to its intersection with Guerins Bridge Rd. West of Guerins Bridge Rd from its intersection with Halfway Creek Rd to its intersection with Wando River (just after Drew Ln). Northwest of the Wando River from its intersection with Guerins Bridge Rd to its intersection with Nowell Creek, with the addition of Pattersonâ€™s Academy. North/northeast of Nowell Creek from its intersection with the Wando River to its intersection with Rebellion Farms Pl. Northeast of Rebellion Farms Pl from its intersection with Nowell Creek to its intersection of Clements Ferry Rd. Northeast of Yellow House Pl from its intersection with Clements Ferry Rd to the Cooper River (across from the Goose Creek). Northeast of Steed Creek Rd from its intersection with Halfway Creek Rd and its intersection with Hwy 41. North of Hwy 402 from its intersection with Hwy 41 (Steed Creek Rd becomes Hwy 402) and its intersection with the railroad tracks near Cordesville. Northwest of the railroad tracks from its intersection with Hwy 402 to its intersection with the Cooper River. The area east of Wappaoolah Plantation and west of the Cooper River, north of Pimlico Blvd and south of Mepkin Abbey is in ZONE G.
North of Cypress Gardens Rd from its intersection with Pimlico Blvd to its intersection with Hwy 17A (S Live Oak Dr). Northwest of Hwy 17A (S Live Oak Dr/Main St) from its intersection with Cypress Gardens Rd to the edge of the county. Northeast of the Berkeley-Dorchester county line from Hwy 17A (Main St) in Summerville to the western county line. East of the Berkeley-Dorchester county line and Berkeley-Orangeburg county line from Pringletown to Lake Marion. Southeast of the Santee River from Lake Marion to Belle Isle Rd. West of Belle Isle Rd from the Santee River to its intersection with Hwy 45. Southwest of Hwy 45 from its intersection with Belle Isle Rd to its intersection with Schurlknight Rd. North of Schurlknight Rd from its intersection with Hwy 45 to its intersection with Peaceful Woods Rd. West of Peaceful Woods Rd (becomes Greenwood Dr) from its intersection with Schurlknight Rd to its intersection with Hwy 17A. South of Hwy 17A from its intersection with Greenwood Dr to its intersection with Tiger Corner Rd. Southwest of Tiger Corner Rd from its intersection with Hwy 17A to its intersection with Horse Island Rd. West of Horse Island Rd from its intersection with Tiger Corner Rd to its intersection with Yellow Jacket Rd. South of Yellow Jacket Rd from its intersection with Horse Island Rd to its intersection with Slash Rd. West of Slash Rd from its intersection with Yellow Jacket Rd to its intersection with Halfway Creek Rd. Northwest of Halfway Creek Rd from its intersection with Slash Rd to its intersection with Steed Creek Rd. East of Halfway Creek Rd from its intersection with Forest Rd 200 (on the Berkeley-Charleston county line) to its intersection with Slash Rd. East of Slash Rd from its intersection with Halfway Creek Rd to its intersection with Yellow Jacket Rd. North of Yellow Jacket Rd from its intersection with Slash Rd to its intersection with Horse Island Rd. East of Horse Island Rd from its intersection with Yellow Jacket Rd to its intersection with Tiger Corner Rd. Northeast of Tiger Corner Rd from its intersection with Horse Island Rd to its intersection with Hwy 17A. North of Hwy 17A from its intersection with Tiger Corner Rd to its intersection with Greenwood Dr.
East of Greenwood Dr (becomes Peaceful Woods Rd) from its intersection with Hwy 17A to its intersection with Schurlknight Rd. Southeast of Schurlknight Rd from its intersection with Peaceful Woods Rd to its intersection with Hwy 45. Northeast of Hwy 45 from its intersection with Schurlknight Rd to its intersection with Belle Isle Rd. East of Belle Isle Rd from its intersection with Hwy 45 to the Santee River. Southwest of the Santee River from Belle Isle Rd to its intersection with the Berkeley-Charleston county line. Northwest of the Berkeley-Charleston county line from its intersection with the Santee River to its intersection with Halfway Creek Rd. Emergency shelters may be opened with the approach of a hurricane to South Carolina. Shelters should generally be used as a place of last resort, as individuals and families are encouraged to have emergency plans in place. These plans should include relatives or friends with whom you can stay or locations to which you will travel. In the event that you must use a shelter, there are two types: American Red Cross and Special Medical Needs Shelters (SMNS). Only individuals with special medical needs will be admitted to SMNS. In the event of a major disaster, monitor local media outlets for information about the nearest open shelter. During an evacuation, listen for emergency alerts on the radio and look for road signs for shelter information. If you relocate to a shelter, be sure to bring blankets and pillows, food for the first day, and any necessary medications and sanitary supplies. It is highly recommended that you bring your Emergency Supplies Kit.